Thanksgiving is my favorite holiday, even when it involves creamed corn and canned cranberry sauce. 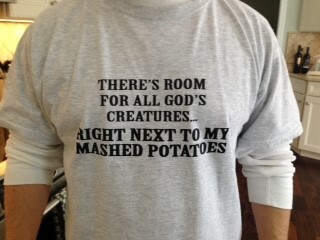 But when you replace those things with 10 pounds of bacon-y, cheesy mashed potatoes, a deep-fried turkey, and my dear, weirdo friends, I’m in heaven! Thanksgiving is the one day a year everyone else becomes as food obsessed as I am. No one thinks it’s strange when you devise (and obsessively revise) your Thanksgiving menu, hunt endlessly for gobbler themed table decorations, or spend three days chopping vegetables and making pies…if it’s Thanksgiving. This is my day people, it’s the essence of who I am, and this year, our Friendsgiving feast was one of my all-time favorites. I’ve moved a lot, I work a lot, I travel a lot…and I live nowhere near my family. Thanksgiving takes on a depressing air when you’re roasting a turkey breast for two and your Grandma’s not asking when you’ll give her another great-grandbaby. This is my second Thanksgiving in Louisville, and I’m sad to report that my first resembled the scenario described above (plus a bottle of champagne for one). This year, however, was the Thanksgiving of my dreams. My boyfriend and I starting collecting all manner of lonely, familyless guests in October. When the big day finally arrived the kitchen was swelling with laughter and delicious aromas and everyone had a drink in their hand. And my heart was bursting with gratitude and love (sorry for the cheese)! 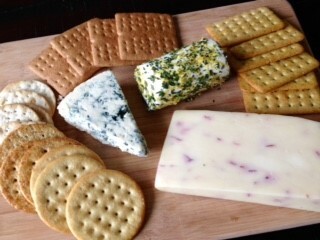 Apps on apps on apps on apps: cheese plate with lemon-thyme goat, Stilton blue, and cranberry cheddar and green olive and pomegranate dip. Although our Friendsgiving table looked very different from the one of my childhood memories, it was full of mouth-watering, perhaps more sophisticated versions of the staples you’d expect. The mashed potatoes were livened up with (four pounds!!!) Parmesan cheese, bacon, and chives; the cranberry sauce was made festive with orange zest and bourbon; and the centerpiece of the meal, the turkey, was injected with Creole seasoning and deep-fried. Now feels like an appropriate time to bust out with a little confession: maybe it’s because I now live in the South or because I’ve always secretly held a special place in my heart for deep-fried poultry, but I really can’t eat another turkey if it hasn’t been submerged in hot oil for hours. Grams, I’m going to have to insist you and Grandpa invest in a turkey fryer, please and thank you. The bird! 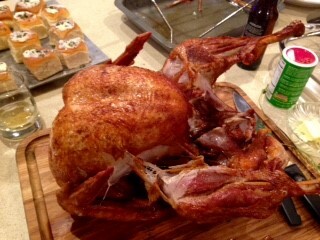 I know it looks like the turkey from National Lampoon’s Christmas Vacation, but it was delicious! Next to it is an update on a green bean casserole with the traditional can of mushroom soup swapped out with a blue cheese cream sauce. 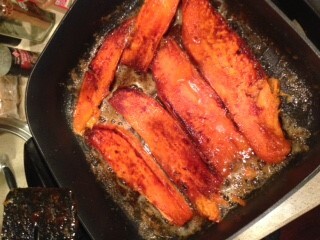 Caramelized sweet potatoes, recipe courtesy of my boyfriend’s mom, and THE mashed potatoes. I’ve talked about them ad nauseam, no need to go there again. Missing from our festivities were crying babies, nagging moms, and in my case, Fox News, but let me assure you, weirdness still abounded. One of our friends was in the middle of a seven-day juice fast and showed up to help with dishes, take the less sober among us to the gas station for more firewood, and gracefully sip a vat of juice that resembled pond water. Another one of our guests thought it was totally appropriate to unbuckle his belt and unbutton his pants at the dinner table mid-meal. And it was. Because it was Friendsgiving. There was no air of politeness or sophistication and that’s just the way I like it. My boyfriend’s brother, Greg. He likes mashed potatoes like whoa. 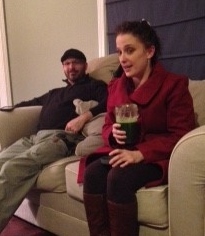 Also, my hero, Conchi with her Thanksgiving feast, green juice. 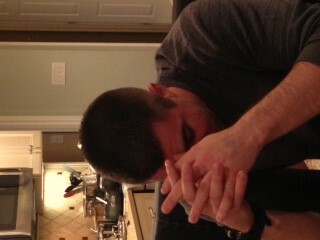 Evidence of the damage: belt unbuckled and head in hands. SUCCESS! Now to the reason you’re here. How about a recipe Amy?! Okay, okay, I’ll stop gushing about my friends and get to the food. Everyone has a dish that absolutely must make an appearance on the Thanksgiving table. For me, it’s stuffing. There are just not enough occasions to enjoy this carb-bomb throughout the year, so when I get the opportunity, I go haaaard. And you all agreed. 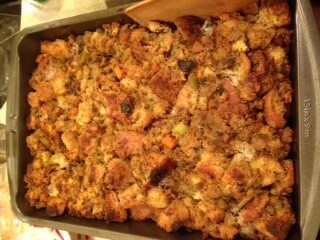 When I asked my Amy Burns the Recipe Book followers on Facebook which dish should be featured as this blog’s first, the result was overwhelming: STUFFING! This recipe is salty, moist, herb-y and contains both sourdough and cornbread. There’s a little bit of bacon mixed in because you know what they say about bacon. You’ll likely be whipping up another round of stuffing for your Christmas feast, and this recipe is the one you’ll want on your holiday table. 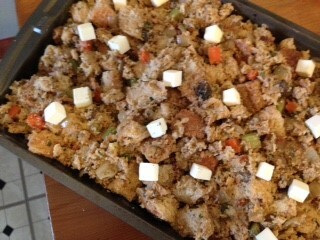 I’d also implore you to incorporate stuffing into your meals more throughout the rest of the year. This recipe would be the bomb with a pork loin roast for Sunday supper. Moral of the story: eat more stuffing! Pre-heat the oven to 350 degrees F. Grease a 9 x 13 baking dish and set aside. Cut or tear the sourdough and cornbread into 1-inch cubes and spread it evenly on a large baking sheet. Toast the bread in the oven for about 20 minutes until completely dry and beginning to crisp and brown. Remove from oven and set aside. 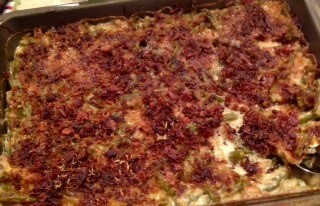 Arrange the bacon in a single layer in a large heavy-bottomed pot or Dutch oven. 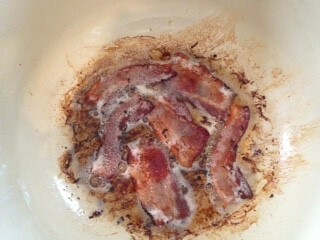 Cook the bacon on medium-low heat until extra-crispy, about 10-12 minutes. 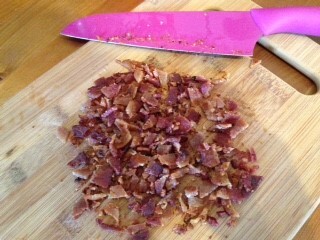 Set the bacon aside on paper towels to drain and then chop into small pieces. Isn’t this a beautiful sight?! Be sure to get the bacon extra crispy. No one likes limp, fatty bacon in their stuffing. And don’t worry about the brown bits at the bottle of the pan. Scrape them up when you sauté you veggies; that’s the best flavor you’ll create in any recipe. 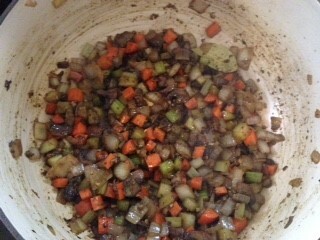 Use the grease leftover in the pan from frying the bacon to sauté the onions, garlic, mushrooms, carrots, and onions. No need to clean it out, all of the fat and brown bits add flavor. Season the mixture with salt and pepper to taste. Cook until the mushrooms have given up their liquid, the onions are translucent, and the carrots and celery are tender, stirring occasionally for about 15 minutes. This is a soffrito, folks. Just a fancy word for carrots, celery, and onions. 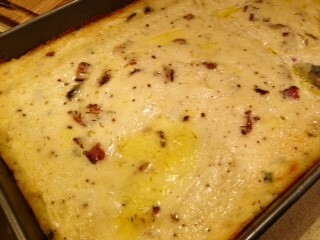 I beefed mine up with garlic, mushroom, and oh yeah, bacon fat! 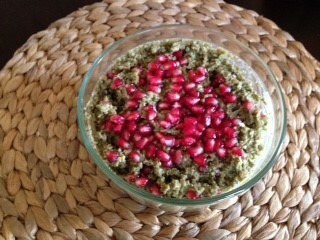 This is the base for so many recipes; get it down, stat! Add the bread mixture and herbs to the vegetable mixture in the Dutch oven. Stir well to combine. Add the chicken stock a cup at a time until the bread mixture is moist. I like a very moist mixture and added all four cups, but if you like a dryer final product, reduce the chicken stock to three cups. Add the bacon crumbles and taste. Add salt and pepper to your liking. The mixture will seem a little more wet than you think it should. Don’t worry, you want all of the pieces of bread almost completely saturated with stock, otherwise you’ll wind up with dry, hard to swallow stuffing and nobody wants that. To the right you’ll see little, beautiful squares of butter dotting the casserole. They’ll give the finished product a crispy, brown top. 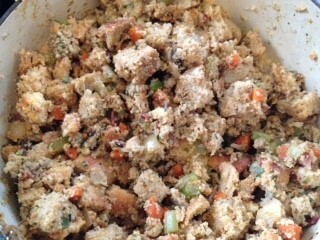 Transfer the stuffing to your greased pan and top with the butter, diced into 1/4-inch pieces. Cover with foil and bake for 40 minutes and then remove the foil and let brown in the oven for another 10-15 minutes. Taaa daaahhh!! Whatta beaut, if I do say so myself. Pardon me, I’m going to the kitchen to make more stuffing. 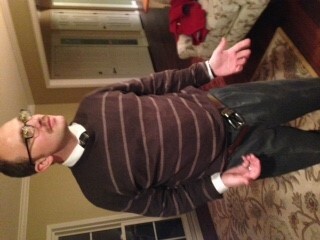 I find my pants often fit too loosely this time of year….